I think in a real analysis course in the second semester of my first year, the teacher was discussing the nested interval theorem, when one of his examples or something he was saying struck me, and I thought of this interesting problem. Well, interesting to me. We pick any fraction, say. Now we look at the interval [0,1]. We divide it into two halves [0,0.5] and [0.5,1] and say, ‘the fraction belongs to this half.’ Say the right half. Then we divide the right half into two halves, check again, and say ‘now it’s in the left half’. We continue like this until we hit the number bang in the middle of an interval. Now, for example, 0.375 = 0.5 – 0.25 + 0.125. A minus sign means an L, a plus sign is an R. So 0.375 is LR. 0.625, which is the fraction the same distance from the right as 0.375 is from the left, is 0.5 + 0.25 – 0.125. So it’s RL. So as you look at fractions equidistant from 0.5 on either side of it, all the R’s and L’s in their sequence get switched. Therefore, the fraction of R’s in one should be the fraction of L’s in the other, or 1 – fraction of R’s. Thus, you expect the graph to be symmetric about the point (0.5, 0.5). (Think about this, no hurry.) What miffed me at this point, therefore, was that this graph didn’t appear to be symmetric with respect to its center point. There’s some fuzzy mess to the left and some scattered points isolated from the main band that are not symmetric at all. 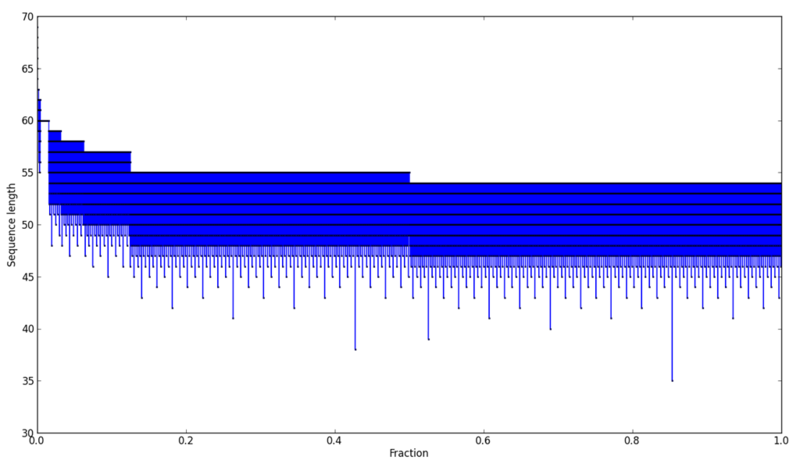 Then I ran some tests with fractions whose sequences aren’t supposed to end at all. Like what? Like 0 and 1, say. If you’ve followed the algorithm, you can tell that we can never arrive at a cleaving of an interval where the separating number is either 0 or 1, because there’s nothing on one side of these numbers. So 0 should just give me LLLLL… and 1 should give me RRRRR…, never ending. However, guess what I found when I looked at the number of L’s and R’s in their sequence. 0 L: 1074, R: 0. 1 L: 0, R: 54. So why do the sequences end? That’s fairly simple. It’s because of the limitation of storing and computing floating point numbers in a computer. Notice that with each step of the sequence we are squeezing our number tighter and tighter, into an interval that is halving its length with each iteration. Very soon, our computer (or the interpreter) arrives at a point that numbers so infinitesimally separated in that tiny interval are no longer separate numbers to it, and so it cannot differentiate between our fraction and the mid-point of the interval, and stops. Exactly how big is this error? It is difficult to tell from looking at these numbers above. One tells you it should be 1/2 1074, the other tells you it’s 1/2 54 (which is closer to where I’d put it, owing to other checks I did and don’t want to discuss here). The final result has to do with all the calculations it is doing at every step, and so all the floating point errors that accumulate at every step. However, I think the only way the answer could still be different for a fraction and its ‘mirror-image’ is if different floating point errors are associated with addition and subtraction, because these two operations have been switched for them. 0.1 L: 28, R: 26. 0.9 L: 25, R: 27. In this case, obviously, the symmetry will not be maintained, because the second pair is 25,27 instead of being 26,28. Thus, the graph is no longer symmetric about the center point. In other words, the point symmetry is repeated on increasingly smaller scales, as it should. The whole bisected nature of the nested intervals is responsible for this. More parallelograms would be revealed if we kept making our resolution finer, and the horizontal extent of these parallelograms are only exhibiting those nested intervals. 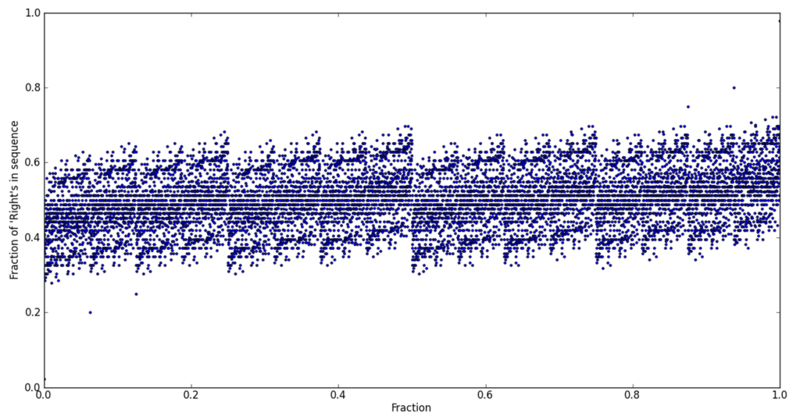 By the way, one data point, corresponding to the fraction 0, had to be removed from this graph, because its sequence length was very big, 1074, as we saw before. Do you see why we should have a picture like this? Think about it, it’s not very hard. 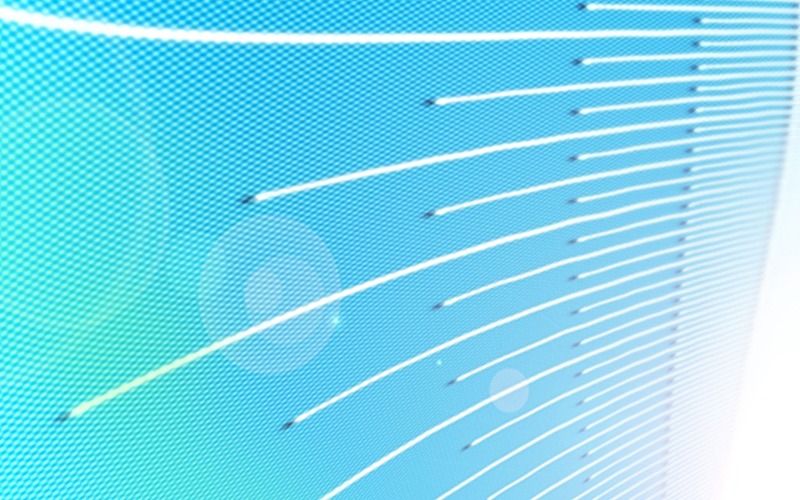 Meanwhile you can download a wallpaper I made in Photoshop out of the above graph, because I liked it so much. That’ll be it for now. Let me know if you have any ideas or questions about all this. This entry was posted in Science, Tech and tagged bisect, Floating point, fractions, graph, interval, Math, maths, matplotlib, python, sequence. Bookmark the permalink. Hi. This is interesting! I had this doubt though – if one end point of every blue vertical line (black dot) represents sequence length, what does the other do? 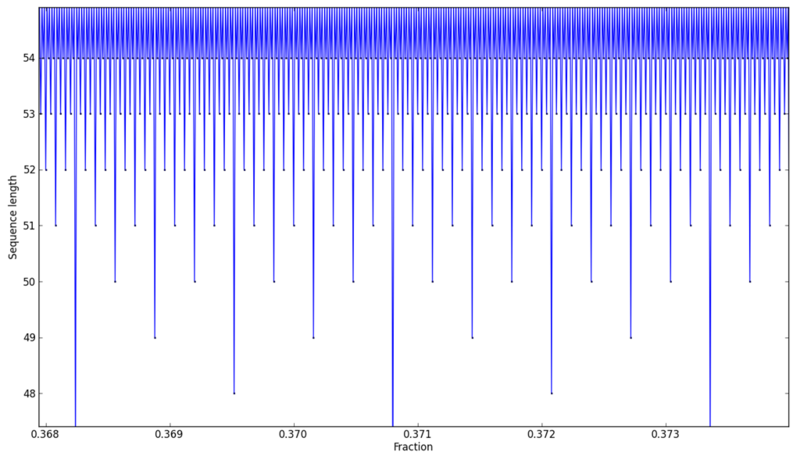 Also, if I’m thinking correctly, the sequence length for 0.5 should be 1, was it? The sequence lengths are marked by black dots. These black dots are joined sequentially by blue lines. If the next number has a large sequence length, the next black dot will be way up, and the blue line will jump up to meet it. 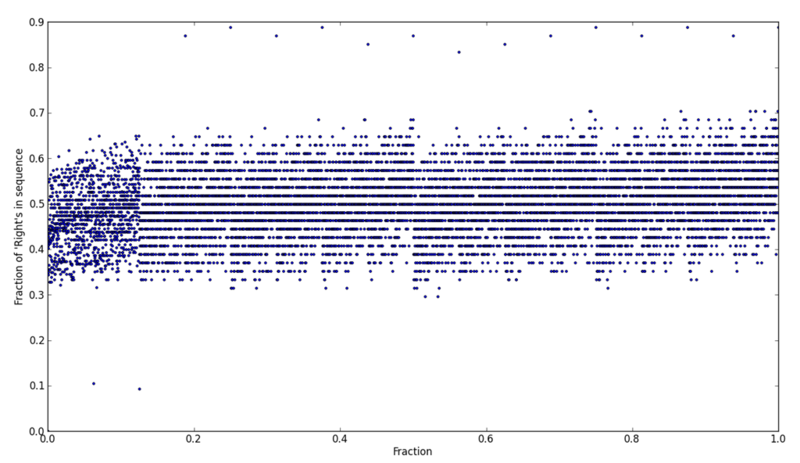 For most numbers in the last few plots, the sequence length was long (around 54 or so, like I mentioned), and was only ended by the error cutoff I specified. So the blue line keeps jumping very frequently up to that height. And yes, ideally it should have been 1 for 0.5. However, due to weirdnesses in floating point representations, the algorithm wasn’t able to latch on to 0.5 in just 1 step.